ULM-200C Ultrasonic Level Meter - Deeter Electronics Ltd. ULM-200C Ultrasonic Level Meter - Deeter Electronics Ltd.
ULM-200C is an ultrasonic non-contacting level meter combining sensor and transmitter in one housing. The measurement range is 8 meters and it is a two-wire loop-powered product. 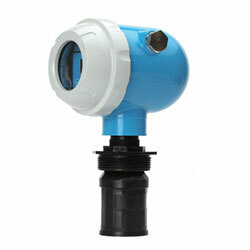 The sensor material is PVDF so it can be applied in various industry applications. Its simple maintenance is one of the benefits of the ULM-200C and the accurate level and reliable performance enable you to effectively monitor levels and ensure that your facilities are running safely and consistently. For further details including wiring diagrams and detailed dimensions, please refer to the ULM-200C Ultrasonic Level Meter Datasheet.